Sign at the entrance to the village. Alma (2011 Population 232) is a village in the parish of Alma, Albert County, New Brunswick, Canada. This village is centered on the small delta of the Upper Salmon River and Cleveland Brook, where they empty into Salisbury Bay. The headquarters of Fundy National Park is in Alma West, making tourism a major part of the local economy. Fishing, of lobster and scallops, is another primary economic activity. The settlement, known as Salmon River Settlement, began in earnest as the lumbering trade took root with the exchange of land-grant title, and construction of a sawmill on the Upper Salmon River by its new owners. Prior to this, loyalist John Coffin, who held the land grant, caused frustration for would-be settlers because of his absence. Thus began the most vibrant period in the communities history. The Parish of Alma was created surrounding the Village in 1856, commemorating the then-recent Battle of Alma during the Crimean war. The Village municipality incorporated in 1966 following sweeping changes that disbanded county councils. It was 18 years prior that the federal government expropriated land in the village and parish west of the Upper Salmon River for the creation of Fundy National Park. Many homes were relocated east of the river as lumber barons gave way to the new land managers, the Parks Canada Agency. In addition to tourism related to the park, lobster and scallop fishing are an important industry based out of Alma's tidal harbour. Alma is famous for its wide variety of seafood chowder restaurants. Due to its proximity to Fundy National Park, Alma receives a considerable amount of tourist traffic in the summertime which supports its restaurants. Despite its population of 232, Alma hosts an annual chowder festival, which pitted seventeen different local seafood restaurants against each other in 2013. Alma was the birthplace of Molly Kool, who in 1939 became Master Mariner for offshore sailing, a captain, a first in the Western World, sailing a commercial Bay of Fundy scow sloop between ports. A monument on the Alma waterfront marks her accomplishment. Judson Arthur Cleveland was possibly the most outstanding citizen of Alma for his role in holding the community in place as his saw mill ran despite tiresome bad economic times, providing livelihoods so that families might remain. He was a long-standing champion of Community on the County Council as a warden and councilor. Alma has a relatively cool, wet and snowy humid continental climate with significant seasonal differences in spite of its near-ocean location. Summers are warm but relatively short, whereas winters are relatively cold but milder than inland areas. ^ Hamilton, William Baillie (1996). Place Names of Atlantic Canada. University of Toronto Press. p. 43. ISBN 0-8020-7570-3. ^ Baird, Donal M. (2001). "Last days of Sail". Women at Sea in the Age of Sail. Nimbus. pp. 2, 215. ISBN 1-55109-267-0. ^ "Alma, new Brunswick". Canadian Climate Normals 1981–2010. Environment Canada. Retrieved 30 March 2015. 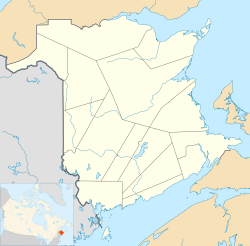 Wikimedia Commons has media related to Alma, New Brunswick. This site documents the Crimean War Monument in the Old Burial Grounds in Halifax, NS. This page was last edited on 8 March 2017, at 03:52 (UTC).